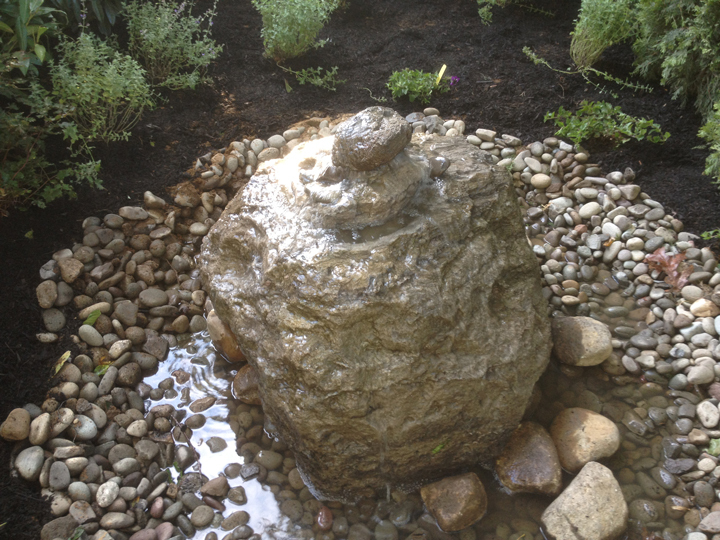 Backyard waterfalls add a touch of luxury and serenity to any landscape design plan. From the sound of flowing water to the relaxation of watching waves tumble over rock or stone, there's a lot to love about waterfalls... and a lot to decide before you build the backyard waterfall of your dreams. Here are just a few of the questions Above All Masonry asks our clients to help us determine what kind of waterfall would be a perfect fit for your new landscape design. How many levels would you like your waterfall to be? From a small foot-high trickle to an impressive tower of water, height is a huge factor when designing backyard waterfalls. It depends both on the size of your space, property elevation, and the ambiance you're trying to create. A Zen garden may not be the place for a gushing fall, but as the centerpiece of a lavishly landscaped yard, bigger may be better. Every space is different! What material would you like the waterfall to be built from? Natural rock, stately stone, minimalist slate: nothing will make a bigger impact than the solid materials under the water. Some clients want their waterfalls to look as though they're completely natural, while others prefer a more modern, sleek aesthetic. Again, it's up to you! Where would you like your backyard waterfall to be? We've built waterfalls that comprise the corner of a yard, flowing from beneath a patio, or trickling into swimming pools—and occasionally a combination of the above! Whether you'd like to build a waterfall that empties into a natural stream flowing through your property or an elegant pondless waterfall in the front yard, we can help you select the perfect spot for your waterfall. When you're ready to take the next step toward building the backyard waterfall of your dreams, we're here to help. Contact our landscape design team today!